You may have already scheduled a time to meet with your funeral director to help you plan the funeral. 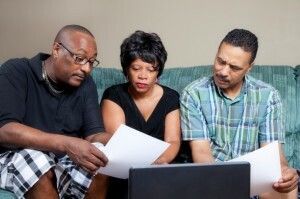 This meeting is called the .arrangement conference.. During the arrangement conference, the funeral director will explain all of the choices available to you and your family, help you make decisions to create your unique funeral, and gather important information about the person who died to complete necessary documents. Above all else, the funeral director will assist you in both arranging for and carrying out a meaningful funeral. What Kind of Funeral Service Will You Have? You can choose from a variety of funeral service types and formats. Some people think funerals must conform to traditional ways, but there is no one right way to have a funeral. Just as grief has many dimensions and is experienced in different ways by different people, funerals are also unique. A funeral should simply be fitting for the person who died and the family and friends who survive them. This is an opportunity to be creative and to share an honest expression of your most heartfelt values. There are no rigid rules that need to be followed, but there are guidelines that can help you if you are unsure how you might proceed.